Stuff you see or do on the information superhighway. 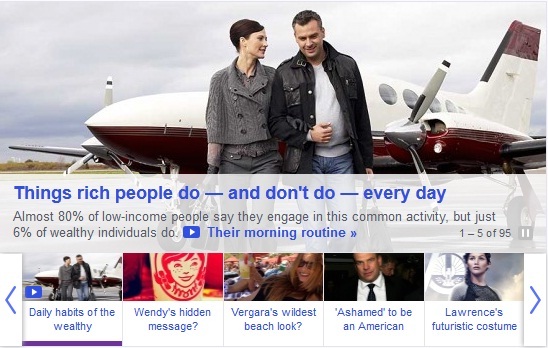 On the main page of the Yahoo! site, there’s always some collection of stories rotating around, offering you a tantalizing glimpse of the details within, showing you a picture and a few words. Today (July 17), around lunchtime, I went through them all to see what they think we’re interested in. Now, I don’t know enough about Yahoo! to know if they have captured my search history and have modelled the story selection in any way on my preferences. But, if so, they have seriously overestimated my interest in shootings in Florida. Welcome to the zeitgeist, George Zimmerman and Trayvon Martin. You get the bulk of the ten stories about the justice system, our biggest category of the day! The next category is why I’m thinking maybe there is a personalizing factor on the site: seven of the stories were about movies or movie actors or what not. Personally, I would have preferred more. There were five stories that I’ll call “lifestyle”, where they offer you tips on remodelling your home, or tell you how rich people live. Awesome! There were five stories about food. Fewer than usual, I think. There were five stories about sports and sports figures. I guess there aren’t any playoffs happening right now, or that number would have been huge! Yahoo! likes to find things that are just plain strange. Five of those today. Five stories about animals, be they cute… or DEADLY! TV stars and their personal details gave us five stories. This not being an election seasons, I only counted four stories about strictly political issues. Four stories about jobs: how to get them, how to survive them, etc. Three stories about musicians and their industry. Three stories about cars and how awesome they are. I assume heath care is no longer an issue in this country. There were only two stories about it. Only two stories about clothing. Two stories about what the Internet is and how it can be weird. Another topic that must no longer be an issue in our society is education, with only two stories. Excellent to hear. Nice job fixing our educational system, whoever did that. Only one about the royal baby. Isn’t that kid born yet? One story about video games. One story about what history would have been like if J. Edgar Hoover had had access to current NSA technology. Because counterfactuals are not only super-valuable, they’re super-important. And one story about a controversy over a French postage stamp. Yeah, you read that right. Well, that’s 88. How many spots are left for ACTUAL NEWS? Two. A story about the North Korean ship that was stopped at the Panama canal trying to sneak Cuban missiles through. And another story about Putin putting pressure on Edward Snowden to not damage US security with his leaks. I get that going to Yahoo! isn’t like going to CNN.com. People don’t come there for news. They come there on their way somewhere else. But do we really need that much sugar and that little meat? However, I do follow and look forward to posts from Today I Watched a Movie. This is partly because I like both movies and movie reviews and partly because I appreciate a good meta-theme as much as the next meta-guy. But also because his posts are succinct (i.e. easy to read on my phone) and very specifically formatted. He evaluates each movie on five metrics: Plot, Characters, Visuals, Rewatchability, and my personal favorite, Product Placement. I don’t even tend to notice product placements in movies unless they are egregious. (I’m looking at you, E.T.) Actually, I find them much more intrusive in TV (Hawaii 5-0), but that’s probably because they just aren’t as good at it yet. Anyway, since I have used about three TIWAM reviews’ worth of words to review TIWAM, I’ll stop soon. Whether I agree with him or not, I love reading this blog. Should I care which Osbourne is seizing? If I don’t, does that make me a bad person? “Miley Cyrus split?” In two? Hopefully? I care as much about a basketball player’s marital status as I do about a basketball players… uh… anything. In that I don’t. What? Is she, like too fat now? Or too thin? Give me more information about Jennie Garth, Trending Now! The only thing scary about Kim Kardashian is everything about Kim Kardashian. Okay. That’s a story. Might have to click on that one. What’s worse that biting into an apple and finding a worm? Getting raped by a giant scorpion. 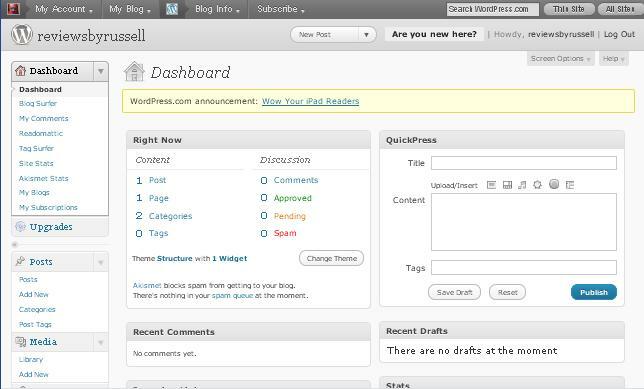 I thought it might be a sort of fun and meta to make my first review about WordPress itself. I’m new to this environment, though not new to blogging in general. I have a friend on TypePad with a site that I contribute to on occasion that seems pretty slick, but I was looking for FREE, not slick. By and large, I’m pleased. It took me a few minutes to find the help screen that told me how to format this text next to the image to the left, because, like I said, I’m stuck in 1997. But I did find it. I hope I like this just as much when I’ve been blogging for six months.